Dennis Hauger #24 TRS Arden Junior Racing Team, performs during round seven of the British F4 championship at Knockhill Racing Circuit on Aug 24-26, 2018. Dennis Hauger kjører denne helgen 7. runde av det britisk F4-mesterskapet på Silverstone. Det kjøres tre finaler i hver runde, så totalt er 18 løp unnagjort foran helgens runde. Dennis ligger på en 3. plass sammenlagt, mens han leder Rookie-klassen. 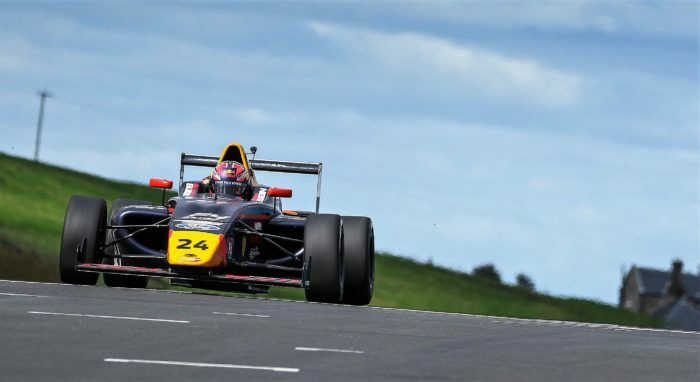 The Red Bull Junior Team have been at the heart of the British F4 action all season and that is almost guaranteed to continue this weekend at Silverstone with the penultimate event in this ultra competitive series. Jack Doohan, the 15-year-old Australian, was second quickest overall in Monday’s test after heading the timing sheets in the morning for Arden. Very much the man on form, Doohan was happy with the way the week started. “It was a really good test, all dry. We had been there before, much earlier in the year when it was very cold so this was quite different and I really enjoyed it on Monday,” enthused Doohan.